Jack Ely? Who? I didn't have a clue until I read: "singer of The Kingsmen has died". Better to write would have been the singer of "Louie Louie". That garage rock staple of a song. The most famous of all versions, no matter who or what recorded it before or after. What may also be a very valid question: Who has ever heard another The Kingsmen song? Eternal fame on the basis of one song, a cover to. 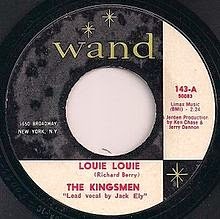 Louie Louie was written by Richard Berry (no relation to Chuck) in 1955 and released on the b-side of a single called 'You are my sunshine' in 1957. According to a book about the song there are at least a 1.000 recorded version; in 1993. Since? Who knows. To the world there's only one that matters and Jack Ely sings on it. Well singing? It is more a raucous screech that Ely released from his thorax. What he sings is for 25% hardly understandable. In fact, in that fantastic building housing the museum on local bands from Washington and Oregon called EMP, there is a letter by J. Edgar Hoover asking for an investigation into the lyric, as he perceived it as undermining to the state in general and the youth of America in particular. Little did he know that the singer had already been sacked by the band before the song became a hit. Ely sounds totally drunk. In a later story it is explained that he had to sing into a microphone hanging from the ceiling above him and had to shout to come in over the noise the band was making. Next to that he was wearing braces. So now you know. 19 Years old Ely was that day in April 1963 when the Kingsmen got one hour of recording time from their dance hall gig owner. The result: 'Louie Louie'. A song that every 60s cover band loves to play. The rhythm is pounding and relentless, the energy one huge, built up portion of testosterone. In other words: it rocks! But is mysterious also. A great combination. On the other hand the recording is so primitive, the playing at best just above mediocre. In the end that doesn't even matter. This record, that doesn't last more than 2.46 minutes, captured all there was to say. Even when Ely makes a mistake by starting to sing right after the solo, it was not corrected. Perhaps there wasn't any more money but it may well be that all the other takes just did not capture what this one did. This take made it famous for always and is the basis for every cover since. And, where do you think Ray Davies got the idea for 'You really got me' from? I'm fairly sure I know. Jack Ely and his band were famous for just one song. A song that is at the heart of every garage rock band that sprouted up in the U.S. from 1964 onwards and is still an example for every garage rock band that makes music today, whether they know it or not. That is leaving behind a legacy I say. I'm putting it on again and have that organ start that riff of riffs.